I haven't posted any sort of craft on here in ages. This is actually strange because it's not like I haven't made a TON of quilts. This past year alone I made 8 baby quilts. I just whipped them up one at a time during naptime, and somehow didn't bother to take a single picture of any of them. They exist, I swear. During this baby quilting extravaganza, I realized that I detest working with minky fabric. You know, the super snuggly baby fabric that feels like soft, warm, fur? Maybe that's why I didn't post any pictures of them. Maybe it was because during every single naptime that I constructed one, I was filled with blinding rage because it is so horrible to work with. Anyways, I recently re-discovered my love of quilting with plain old cotton when I had a clear direction of what I wanted to make. I'm done with baby quilts for awhile, and I needed a new idea. My husband suggested that I make a quilt for a couple we know that are getting married this February. They are having a destination wedding and requested no gifts. Pfffft. No gifts? Really? Well, they are actually serious, but I just couldn't bear to not give anything. So voila! A handmade gift. They'd be jerks if they didn't accept it. They could have refused to cash a cheque, but a handmade quilt? No. That would have made them horrible people. I gave it to them this past weekend, and they graciously accepted it. Take that, NO GIFTS. This quilt was amazing and SO EASY. 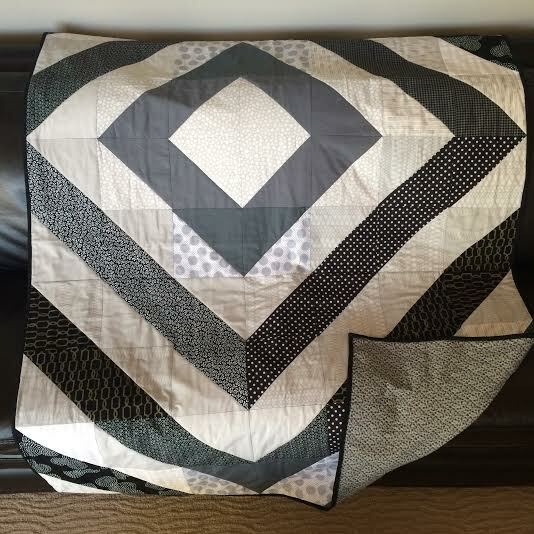 I'm a self-taught, very, very beginner quilter, so I was thrilled with the results. I didn't do any detailed stitching as seen in my inspiration project, but I was thrilled nonetheless. I cannot believe I have not seen this post until now. As the recipient of this extremely well-crafted, beautiful quilt, I have to say that receiving this as our wedding gift (even though you went against our wishes) was our favourite gift. it is on display in the living room and I cozy up with it regularly and gets tons of compliments on it. It matches perfectly. Thank you for taking the time to make such a heartfelt gift for us. And you are correct, we would have been horrible jerks to not accept. Keep on blogging and blowing us away with your talent!